Art supplies are one of my favorite gifts for kids. I try to keep a supply on hand for birthday gifts and moments of desperation. 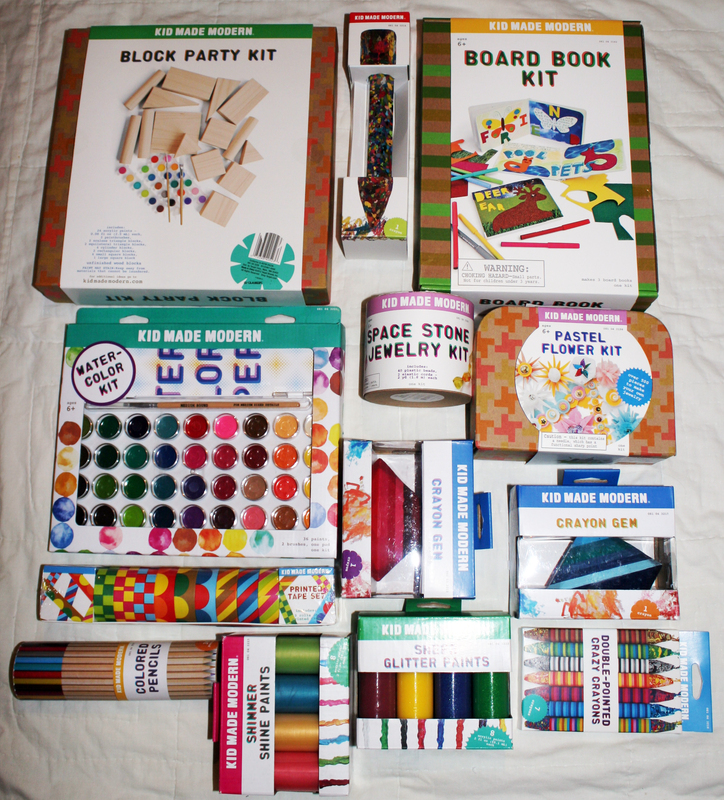 These Kid Made Modern art supplies by Todd Oldham for Target occupy a large section in our emergency party box. 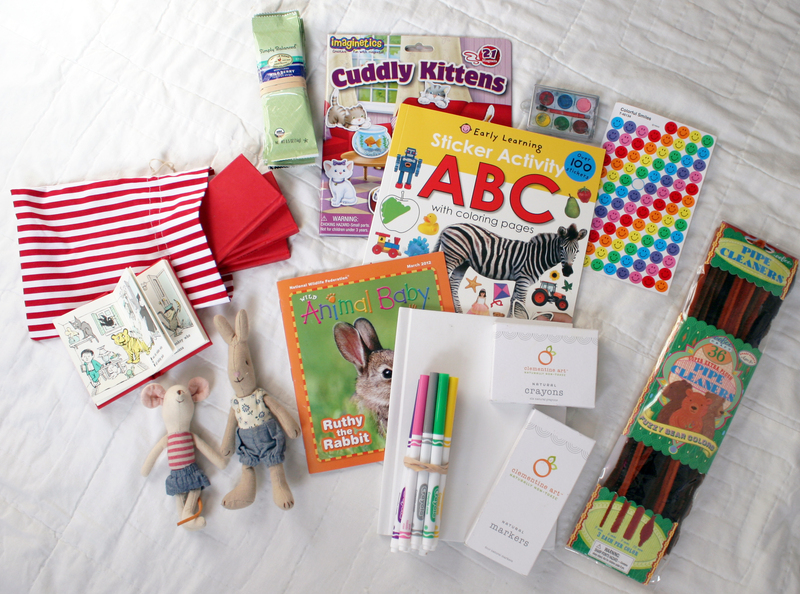 The quality is great and I love the Kid Made Modern packaging and smart, thoughtful art kits. 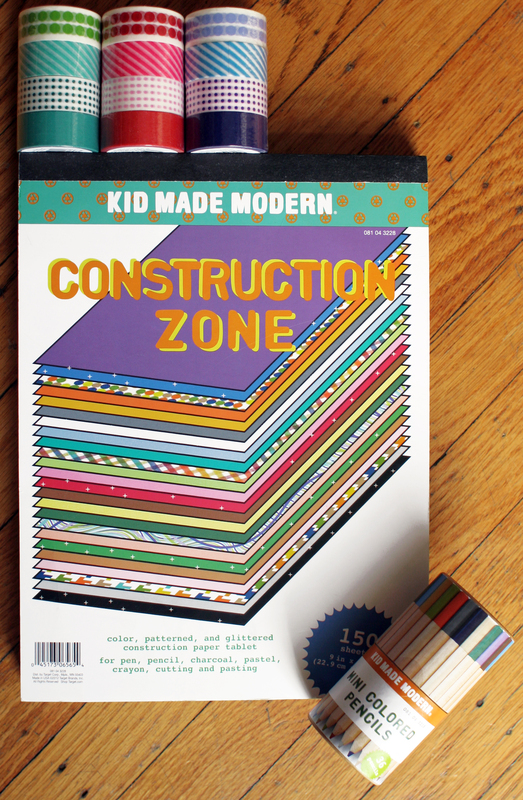 This Construction Zone block of paper has lots of great colors and patterns and different weights of paper. The Mini Colored Pencils are perfect for little hands and the colors are beautiful. I recently added these paper tapes from the Target office section to our arsenal. The tapes come in packs of four and are $4 per pack. 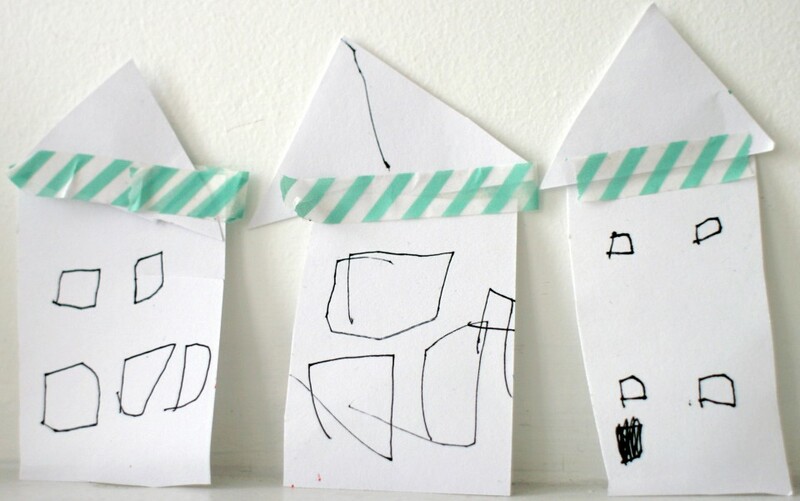 My kids can spend hours tearing and sticking paper tape (exhibit A here). It is good to be prepared. 1. Fold tissue paper in half. Place a strip of double-stick tape along the folded seam. 2. 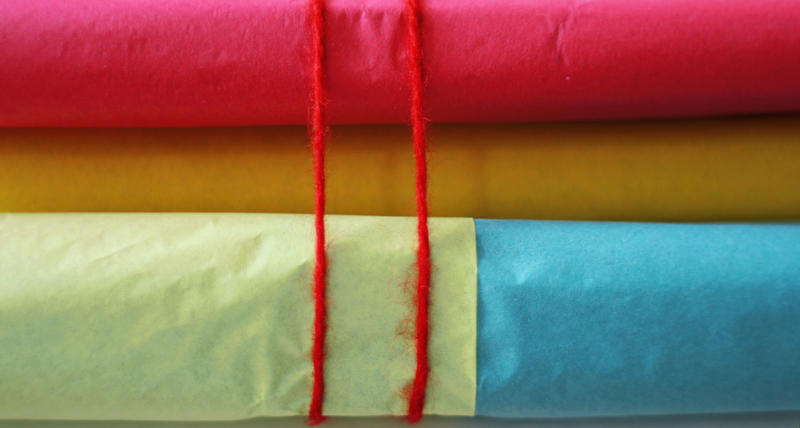 Place a folded, contrasting color of tissue paper along the tape and press to stick. 3. Cut tissue to fit gift. 4. 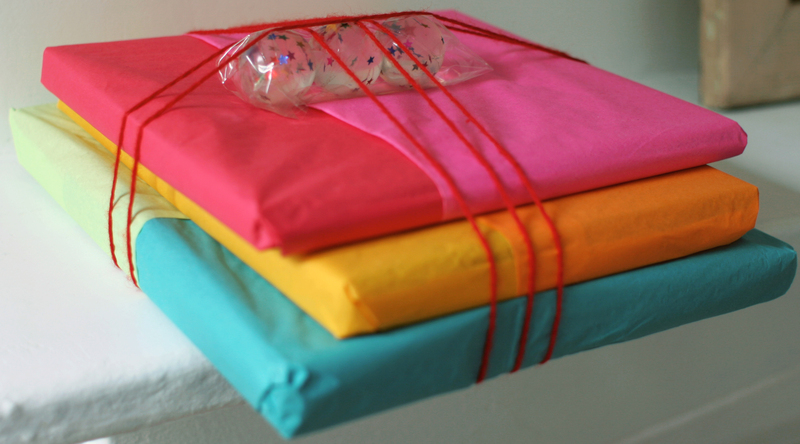 Wrap each gift with different color combinations, put a strip of tape between each and stack. Tie with a ribbon. We added some star-filled bouncy balls from Target. Enjoy! *What we found in the back yard (so far). 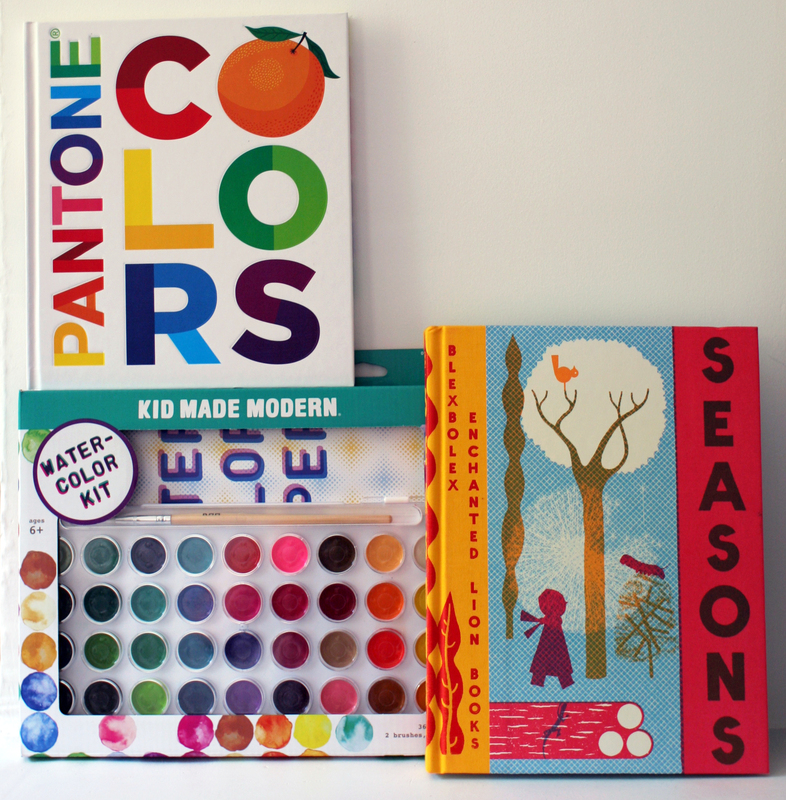 The new Todd Oldham for Target line of kids’ art supplies is in stores! I had it on my calendar for yesterday and I think I may have been the first one to discover the pile in our local Target. 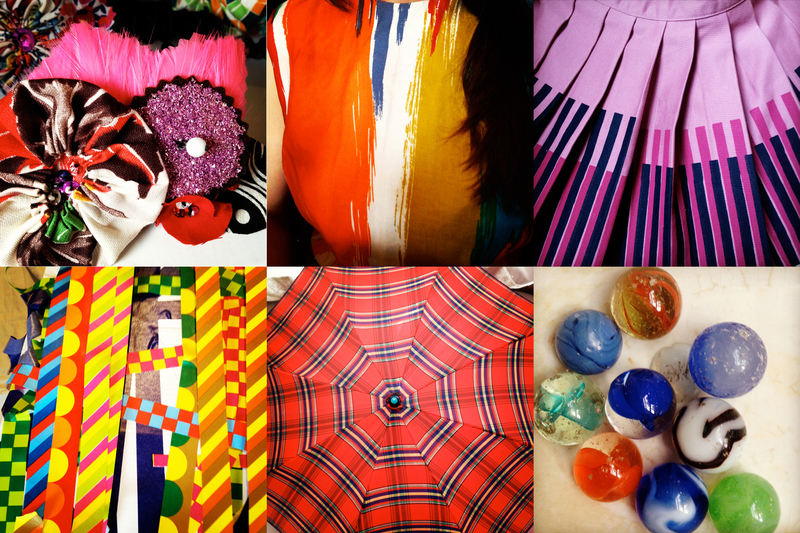 All of the Kid Made Modern pieces are under $20 and the packaging and bright colors make them perfect gifts. I love the craft kits that designer Todd Oldham came up with: diy painted wooden blocks, board book, felt flowers…His fun aesthetic translates perfectly to kids’ products. My mom always had a secret closet stash of gifts and I love being prepared. Art supplies are the best! We have yet to try flying with both kids. An upcoming visit to the West coast has me excited and a bit worried about how to entertain two on the road. So I filled up Ada’s dog backpack with activities and fun stuff for the flight. (Top secret to her until takeoff). 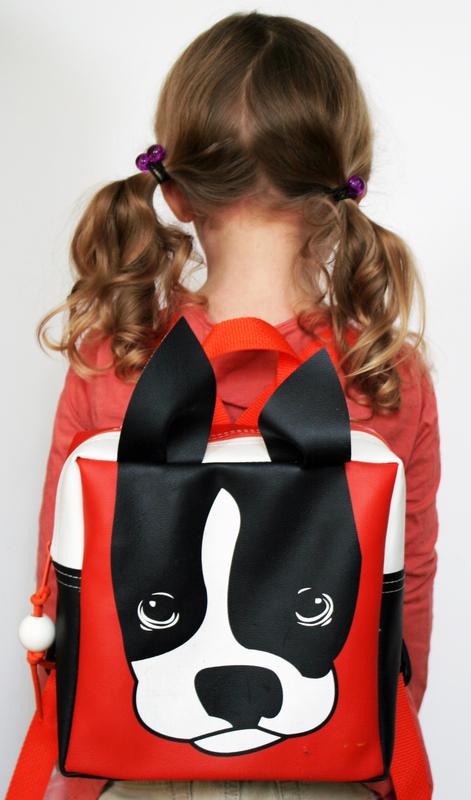 *Little Packrats bags are adorable and made in the USA. *Maurice Sendak’s Nutshell Library– four tiny, poetic stories with detailed illustrations. We traded their cardboard for a softer pouch. *Organic fruit snacks from Target. 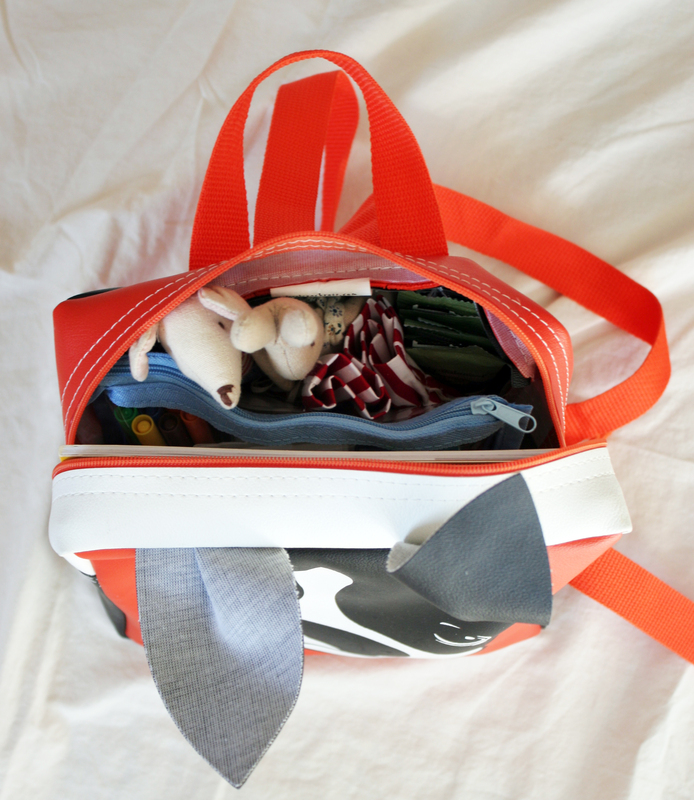 A rubber band keeps them under control in the bag. *Sticker and magnet books. Small enough to fit in a child’s backpack. *Wild Animal Baby Magazine from the National Wildlife Federation. Ada gets as excited about a new issue in the mail as I do about my magazines. This one is small enough for little hands. *A pristine blank book to fill up with drawings, paintings and stickers. *Clementine art supplies. They are non-toxic and come in sweet little packages. *Pipe Cleaners in Brown Bear Colors. *A Rabbit and a Mouse. This should get us through the flight with minimal IPod time.